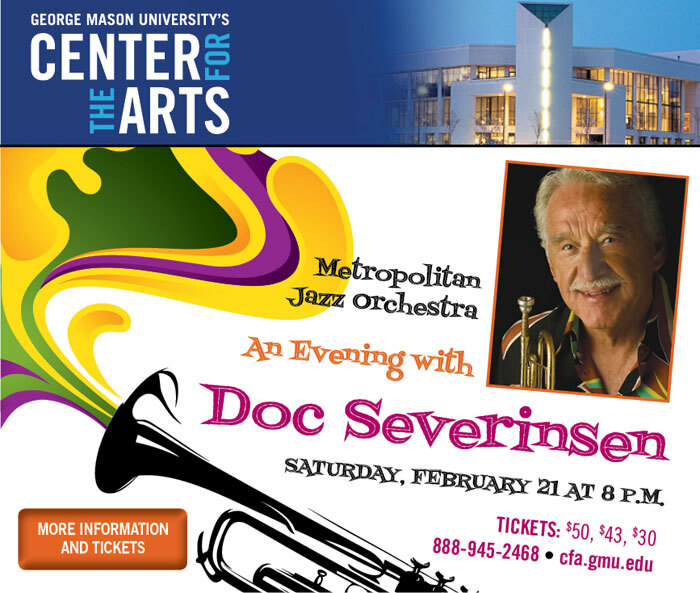 Trumpet legend Doc Severinsen teams up with D.C.’s own Metropolitan Jazz Orchestra for an evening of high-flying jazz music! From his incomparable talent to his unforgettable fashions, the former bandleader of The Tonight Show with Johnny Carson is sure to wow the audience with this incredible evening of jazz classics. Joining Doc on stage is the Metropolitan Jazz Orchestra, featuring top jazz musicians from throughout the greater D.C. area, including artistic director and alto sax virtuoso Jim Carroll. Don’t miss this evening of big band music shimmering with the sounds of this outstanding trumpeter!